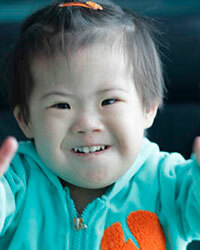 For such a little girl, Clara has always made a big impact on the people who care for her. Today, she is surprising everyone with her amazing strength and consistent progress. However, for most of her life, Clara has impressed people by how weak and fragile she was as she struggled to survive. Clara entered the New Day North program in October of 2014. 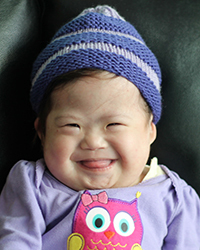 Only about five months old at the time and recently abandoned, Clara was seriously ill. She was diagnosed with Down Syndrome and multiple congenital heart defects. She was also very malnourished, only weighing about 8 ½ lbs, and her heart defects caused her to turn blue when she cried. The next couple of months for Clara were quite difficult. 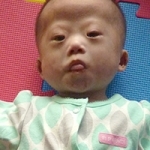 While she needed to gain strength before transferring to a Beijing hospital for surgery, Clara was instead becoming even weaker. Continuously sick, she had to be admitted to the hospital multiple times for treatment. 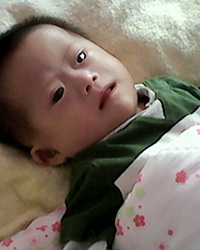 On one occasion, Clara’s condition became quite critical, and she was rushed to the local hospital in heart failure. 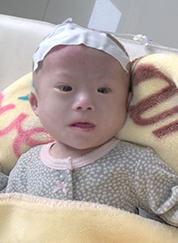 As many prayed for her, Clara’s situation finally stabilized enough for transfer to Beijing for evaluation by some of the top hospitals for pediatric heart surgery in the country. One by one, the doctors came back with the hard news. 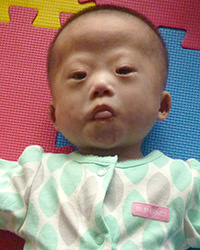 Even if Clara gained weight, heart surgery was going to be dangerous, and her chance of a good recovery was small. Clara had high pulmonary hypertension, so even if her heart was completely repaired, her lungs and the rest of her body would struggle to recover and support her little body. 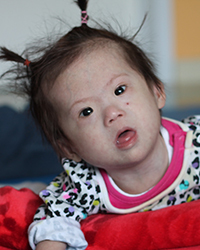 Since heart surgery was her only hope, Clara was admitted on February 6, 2015 to one of the best Cardiology hospitals in Beijing, and had open-heart surgery the next week. The surgery was a success! Clara pulled through and surprised everyone with a good initial recovery from surgery. However, though her heart had been repaired, Clara’s little body was struggling. 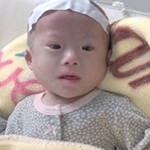 Within a few days after being discharged from the hospital, she went into respiratory distress and had to be put on oxygen, and readmitted into the hospital with severe complications. The next two months were like a roller-coaster for Clara. As doctors and nurses continued to care for her, and people all over the world continued to pray, little Clara continued to fight to recover. After a week in the hospital, she had stabilized and was released – only to be back in the hospital again just ten days later. This time, Clara had pneumonia, as well as pleural effusions, abnormal amounts of fluid surrounding her lungs. Once again, Clara bounced back, and left the hospital on strict fluid restrictions. These measures helped Clara stay free of effusions and pneumonia, but also made it hard for her to gain weight. Finally, after staying in Beijing for another month and remaining stable, although still quite thin, Clara returned to New Day North on May 12th. Clara weighed less than 11 lb on her first birthday, but she was full of life, able to play and interact and even roll around a bit. 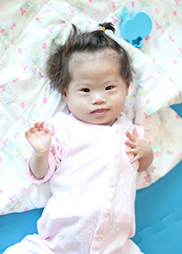 Since her return, Clara’s nannies have cared carefully for her, and she has remained healthy without any medical emergencies. She is also finally gaining weight, despite still being on fluid restrictions. Within the first two months after returning from Beijing, she gained 2 ½ pounds and became more active and capable every day. Little Clara continues to make a big impact on the people around her, surprising them both with her frailty, as well as her hope and determination. 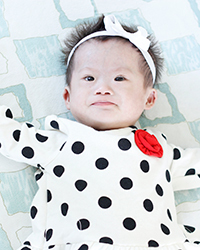 Her life is a miracle, and a beautiful picture of grace and transformation.